Some of the surgical team in Cubulco, Guatemala. Sometimes solving problems requires nothing short of a little miracle, and Dr. Bergseng knows all about that. With about a week left before his trip to Cubulco, Guatemala he was told a surgical headlight was a must. He would very shortly be on a mission trip with Christian Medical and Dental Association (CMDA) in a remote area of Guatemala in which the operating room would be equipped with substandard overhead lighting. In addition, power outages are not uncommon in the area. 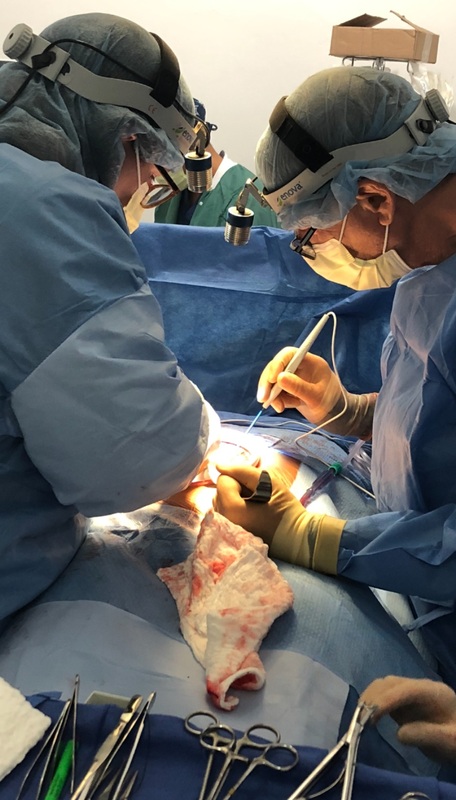 The Guatemalan operation partner, Advancing Ministry of Gospel (AMG), made many preparations but could not provide headlights for the surgeons. After some failed attempts to borrow headlights from his home hospital, he was left with no prospects for lighting, and just a few days to go. Realizing that he may need to spend a few thousand dollars – despite needing the headlight only for few-and-far-between missions – he decided to go on the internet to learn about his options, and check for last resorts. A quick google search of “Surgical Headlights” yielded countless results, and as he scrolled and clicked he came across goenova.com. Upon clicking around, he soon learned that Enova Illumination is in Minneapolis, a short drive from his home in Glencoe, MN. He also happened to have some errands in Minneapolis’ twin city of Saint Paul. Thinking that maybe a headlight purchase was his only hope, but happy that he could at least complete his purchase before he departed, he came up to Northeast Minneapolis in search of light. After a tumultuous trek around the mid-city industrial park looking for the fabled LED Headlight manufacturer, things were looking a bit bleak. The notoriously hard to find offices of Enova had him stumped. Nearby businesses did not know where (or if) Enova could be found, and the number – 1717 Broadway – was nowhere in sight. Stopping at the corner gas station, he thought his lighting options for Guatemala weren’t looking so good. Yet, out of the corner of his eye, he saw that numbers far down the side of the business park (through the back of the gas station parking lot) were pretty close to 1717. Deciding to give it one more try, he drove through the lot and, sure enough, found Enova. And better yet, was welcomed by Jordyn upon his arrival. Jordyn explained Enova’s Mission Program, saying that if Dr. Bergseng had $100 to pay the rental/cleaning fee, he could take two surgical headlights with him right then and there. And that’s just what he did. After his problems were solved, he set off for what was to become an amazing experience. Upon descent by plane into Guatemala City, he noticed an orange glow in the distance. Not knowing why or how the sky could produce that color, he asked a local what caused the glow and was told it was lava. “Central Guatemala is nothing but mountains and mountains and mountains and volcanoes,” Dr. Bergseng says. The stunning scenery, as it turns out, was just a bonus. Cubulco was the surgical destination. A medium-sized town many hours from the Capital, its population is mainly of mixed Spanish and indigenous heritage. Armed with a Spanish translator, most of the necessary information could pass easily between the surgical team and the local patients. However, one of Dr. Bergseng’s patients spoke only Achi, a Mayan indigenous language. Since the translator did not speak Achi, the only person who could help was the patient’s daughter, who spoke Achi and Spanish. Throughout the preparations, procedure, and post-op, every communication was a game of language conversion. Dr. Bergseng would speak English to the translator, who would translate it to Spanish for the Patient’s daughter, who would then translate it to Achi to her mother. When the mother wanted to respond, the entire process would happen in reverse, eventually giving Dr. Bergseng the surely crucial information. Despite being so far from home that every communication required two translations, it turned out Minnesota was not actually that far away. During a gallbladder removal, Dr. Bergseng realized he was going to need some help. Calling to an OBGYN on the team for assistance, she came over to lend a hand. After some casual conversation, he learned that his fellow doctor practiced in Portland, Oregon, but was originally from Minnesota. Shocked and curious which part of Minnesota his colleague hailed from, Dr. Bergseng asked what town. Despite all odds, both were from Edina and were graduates of Edina High School. Enova’s XLT-125A in use by both surgeons. 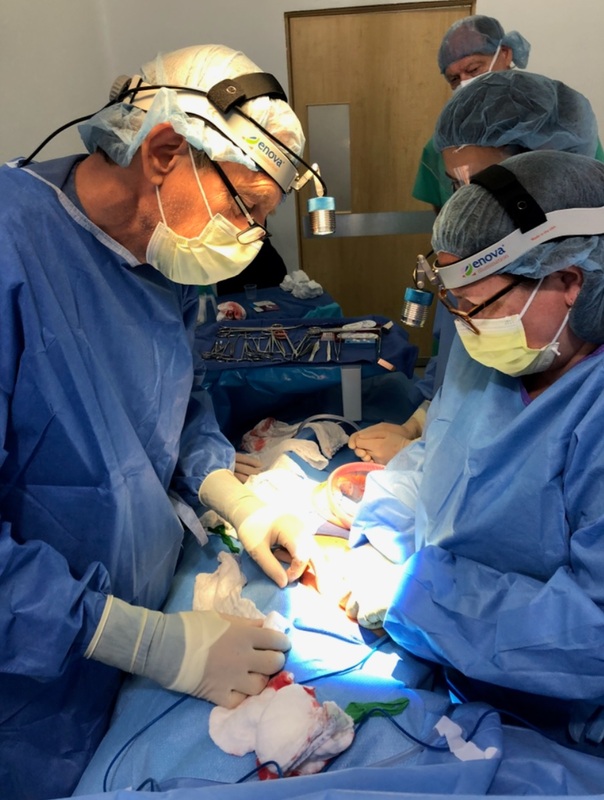 The surgical team in Cubulco consisted of two general surgeons and three OBGYNs from around the United States plus support staff. 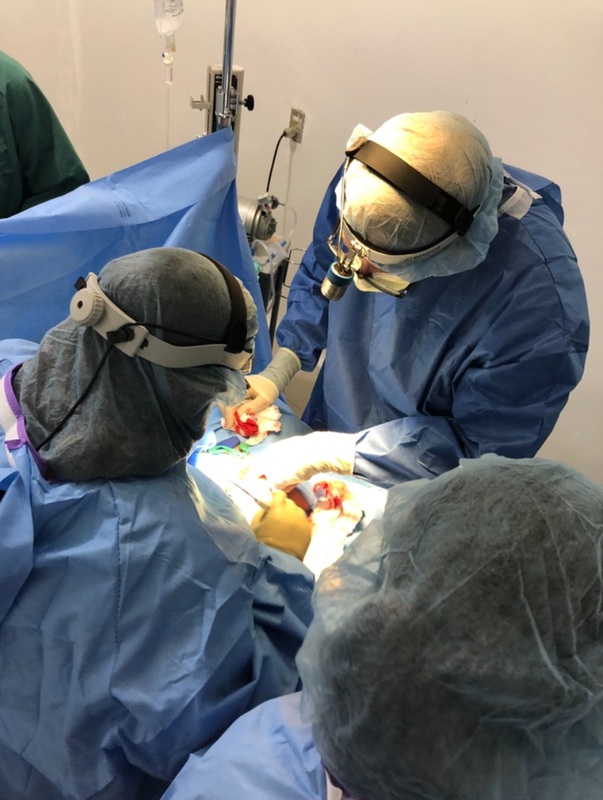 During their time there, Dr. Bergseng and the other general surgeons performed around 10 gallbladder removals, 6 hernia surgeries, 2 appendectomies and removed “a lot of lumps and bumps.” The OBGYN team performed around 10 hysterectomies, more lumps and bumps, and even one C-section. “So there was a little baby around,” he said as he smiled. Throughout the procedures, Dr. Bergseng used the Enova headlights we sent along. During occasional power outages and procedures on larger patients, Dr. Bergseng says the XLT-125A was invaluable. “There was no diminution,” he says, adding that the headlights were even better than those he used at his hospital in MN. If you are wondering how one surgeon was able to use two headlights, there is a little story there too. One of the other surgeons on the program was using her husband’s fishing headlight and complained that it wasn’t doing the trick. When she found out that Dr. Bergseng had brought two lights, she asked to borrow his and wouldn’t take it off for the rest of the trip, using it in every surgery. This is not the sight you typically want to see in the OR. Just like every Mission story, the fun and formative experiences go on and on, longer than there is time for in this write-up. 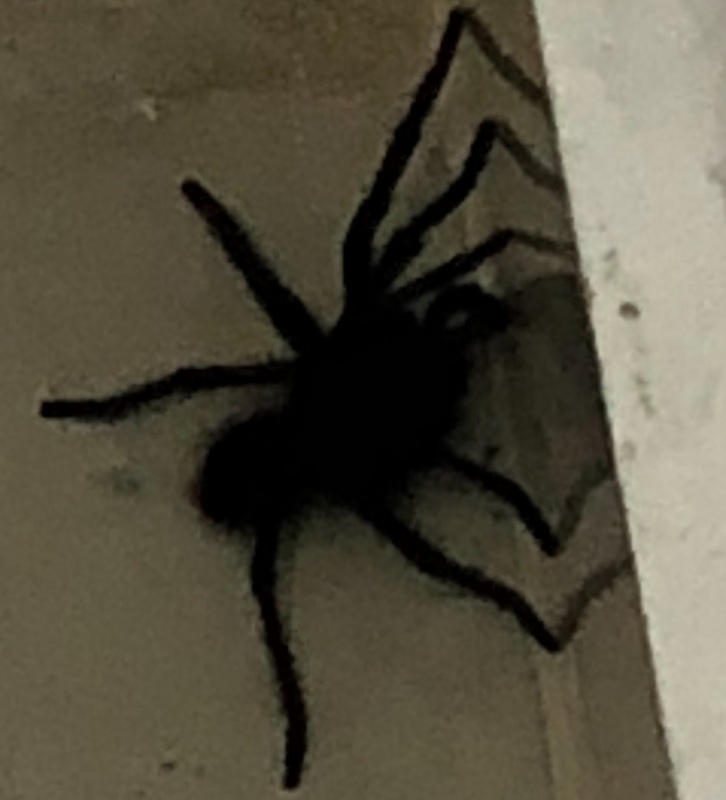 But one of the funny tidbits that Dr. Bergseng described involved a tarantula in the OR (there’s even a photo at right to help paint the picture). Dr. Bergseng is not sure when his next trip will be, but we couldn’t have been happier that he found us for this one. Thank you for the amazing story Dr. Bergseng, we hope to see you again! To learn more about Enova’s mission program, visit Enova’s Mission Program. Previous PostPrevious Enova’s LED Surgical Headlight models – The names say a lot! Next PostNext September 2018 Shedding Light – How can LED Surgical headlights make a difference?